Colin and Kathy Miller opened Mullarneys Garden Center in 1989. As a family owned business, we are dedicated to offering you quality products and services, as well as our time and interest in your individual wants and needs. Our brands have been carefully selected to ensure your purchases become true investments that will stand the test of time. 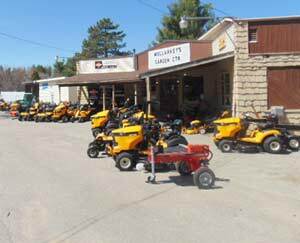 We welcome you to stop by our showroom at 2545 State Route 11, North Bangor, NY or give us a call at 518-483-1111. Q - Does your company accept credit cards? A - Yes. We accept Mastercard, Visa and debit cards. Q - Does your company offer financing? A - Yes. We offer 12 months, same as cash, with no interest and minimum monthly payments. We offer up to 24, 36, 48 or 60 months at 0% interest if you have qualified credit. Ask our reps for details. Q - How can I compare different fuel prices? A - By clicking on this link you will be directed to Penn State University College of Agricultural Sciences where you can input your fuel information and compare costs. Were always around to help you out. Send us an email or give us a call!